California Wine Club: Advice from the Wall Street Journal! The best wines come from the little wineries you've never heard of, The WSJ advises. This is exactly what The California Wine Club is all about! Save $35.95 on your first month: Use promo code ADVISOR. The alcoholic-beverage wholesale lobby is at it again, reaching into its deep pockets in an effort to buy its monopoly back after the Supreme Court said no. In an American era when some join noisy rallies to shout out anger against government, wine lovers as citizens now have an opportunity to try to make the engine of government work for us. At stake is a bizarre piece of legislation proposed by the well-funded wholesale beer distributors, gleefully joined by the wine and liquor distribution industry. The bill, H.R. 5034, would exempt state alcohol beverage laws from most federal review, restoring the situation that existed before the Supreme Court banned such anti-competitive and discriminatory practices in 2005, opening the way to legal direct-to-consumer wine sales in many states. "Attention Wine Lovers ... We need your help to fight a wine bill (HR 5034) that has been submitted to Congress. The national bill would stop all alcohol shipments from wineries, breweries, distilleries and manufacturers. If passed, it would lead to severe limitation on wine shipping and severely hurt the small artisan wineries and progressive wine retailers that rely on direct wine shipping. "The bill would forever prevent court challenges of laws that discriminate against out-of-state wine shippers. It was these sort of court challenges by wineries, retailers and consumers that led to the groundbreaking 2005 Granholm v. Heald Supreme Court decision that led to the creation of the direct to consumer wine sales channel." The wine-consumer organization Free The Grapes, declaring the measure "a monopoly power grab," has more information online with some arguments against it. This page also includes A simple form that makes it easy to contact your own representative and senators. The handy form includes suggested language, and it's editable so you can personalize or rewrite the letter as you like. If your representative chose to sponsor H.R. 5034, you might want to ask him or her a few pointed questions, although I suggest you do so civilly, keeping the principle of catching more flies with honey than with vinegar in mind. The primary sponsors are Representatives Bill Delehunt (D-Mass. ), Howard Coble (R-N.C.), Mike Quigley (D-Ill.) and Jason Chaffetz (R-Utah). It has 32 co-sponsors. For up-to-date information on sponsors, here's a link to the Library of Congress search results on H.R. 5034. Click, read, then contact your Congresspeople. Even if you have your doubts about government, when it's this easy to express our opinions directly to the people who represent us, it's worth a try. Recently The Wall Street Journal offered this advice: "Drop into the little places you've never heard of. You are more likely to meet the actual owners or winemakers and have a better time. Not only that, but these are the wines you could never buy at home ..."
This is exactly what The California Wine Club is all about! Since 1990 The California Wine Club has been introducing wine enthusiasts to limited production wines, handcrafted by California's best "mom & pop" wineries (no bulk wine - ever!). These award-winning wines are typically only found at the winery itself, and that's what makes The California Wine Club a true wine adventure. Try it for yourself, or send a gift and get your first month for just $13 (save $35.95). Visit www.cawineclub.com or call 1-800-777-4443 and use promo code: ADVISOR. FOOD MATCH: Steaks, burgers pork chops or grilled chicken would all serve it well. It was a find match with both locavore burgers kicked up with Southwestern spices and a Portuguese-style kale soup with bits of ham. VALUE: An exceptionally appealing red wine, worth buying by the case at this price point, but it's worth shopping around, as it's available in some markets for as little as $9, at which point I would recommend renting a pickup truck and backing it up to the wine-shop door. 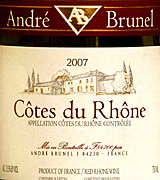 Search for vendors and compare prices for André Brunel's Côtes du Rhônes on Wine-Searcher.com.